Nobel laureate's double standards toe line of pro-Western "pivot" toward Asia and the recolonization of Myanmar. The violence against the Rohingya, carried out by Suu Kyi's own support base, threatens to destabilize the Rakhine state where exists significant Chinese interests including a deep-water port and an oil pipeline terminal that is to connect Sittwe, Myanmar with Kunming, China. 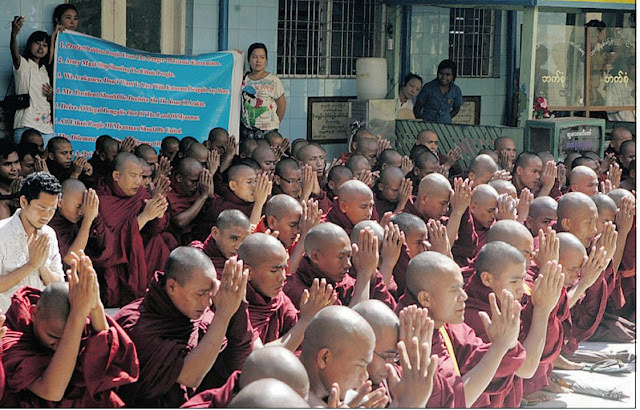 Likewise, the protests in Monywa, located further north, target a Chinese mine. The protesters cited "human rights" and "environmental" concerns, mirroring identical efforts by NGOs subsidized by Western corporate-financier interests seeking to supplant China and exploit Myanmar's vast natural resources themselves, who had targeted and halted the construction of Myitsone Dam. Image: Praying for genocide. While Associated Press claims these protesters are demonstrating against ethnic violence targeting Rohingya refugees, the sign they carry clearly states that they seek the expulsion of the refugees from Myanmar, and are merely protesting against the Myanmar Army's use of force to protect the refugees from attacks that have left scores dead and thousands of homes destroyed. One of the most prominent of these NGOs is the "Burma River Network" (BRN). While BRN's website fails to mention where they get their funding or who they are affiliated with, California-based, Ford Foundation, Sigrid Rausing Trust, Tides Foundation, Open Society-funded "International Rivers (page 3)" who is also active in blocking the development of Myanmar's rivers, gives them away by listing them as "partners" alongside the "Kachin Development Networking Group" (KDNG). Together these organizations interlock, cross-reference, and cross-post with other US-funded NGOs operating in Myanmar. These include the Irrawaddy, Era Journal, and the Democratic Voice of Burma, all admitted by the Burma Campaign UK (page 15) to be funded by the National Endowment for Democracy (NED) along with "Mizzima" also fully funded by NED and Soros' Open Society. The protests at the Monywa mine have been ongoing. They too have been supported by Western corporate-financier funded foundations. 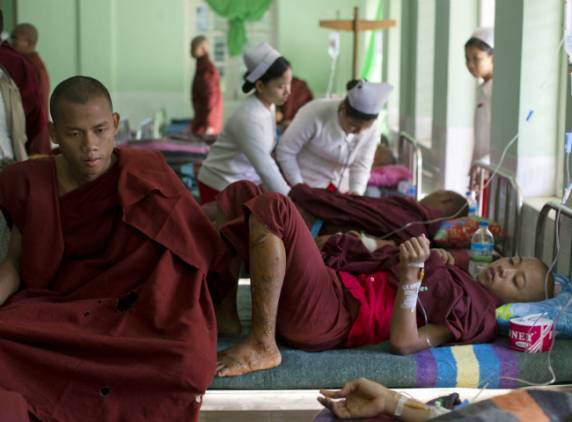 The "Burma Partnership" has been particularly prolific in regards to protesting China's mine. Upon its "About Us" page, is listed a myriad of associations and organizations directly linked to Aung San Suu Kyi's National League for Democracy (NLD) party, including the Students and Youth Congress of Burma, the Forum for Democracy in Burma, and the Nationalities Youth Forum, which is directly funded by the Euro-Burma Office (in turn funded by the EU, and US National Endowment for Democracy), and convicted financial criminal George Soros' Open Society. A clear pattern has developed, exposing Aung San Suu Kyi's motives as being purely political. Her indefensible silence over violence against the Ronhingya, while she vocally decries crackdowns on her own Western-funded mobs as they attempt to evict Chinese interests from the country - all pave the way for equal or worse exploitation by uncontested Western corporate-financier hegemony as Western interests prepare to take advantage of the newly "opened" Myanmar as part of their "pivot" toward Asia.